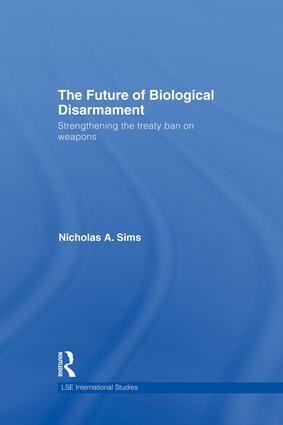 This book examines the politics of biological disarmament, focusing on the Biological Weapons Convention (BWC) as a treaty regime and the cornerstone of biological disarmament efforts. Biological weapons have long been banned, but the ban needs strengthening. The 1972 Biological Weapons Convention (BWC) is the cornerstone of this disarmament regime. After years of deadlock and disappointment its Sixth Review Conference in 2006 generated new hope that biological disarmament could be reinforced from within. This book studies the intricate diplomacy of the Sixth Review Conference as a key moment in the recovery of self-confidence by the treaty parties. It makes detailed proposals for developing an accountability framework and stronger institutions so that the treaty regime can work better. It examines alternative futures for the BWC and the trajectories to be avoided or encouraged in the short, medium and longer terms as its regime evolves. Controversially, by comparing treaty constraints on biological, chemical and nuclear weapons it restores the BWC firmly to the realm of disarmament rather than arms control and rescues it from misleading identifications with counterproliferation and counterterrorism models. This book will appeal to policy-makers, diplomats and students of biological weapons, weapons of mass destruction, international security and IR in general. Nicholas A. Sims is Reader in International Relations at the London School of Economics. He is author of four books on aspects of disarmament.